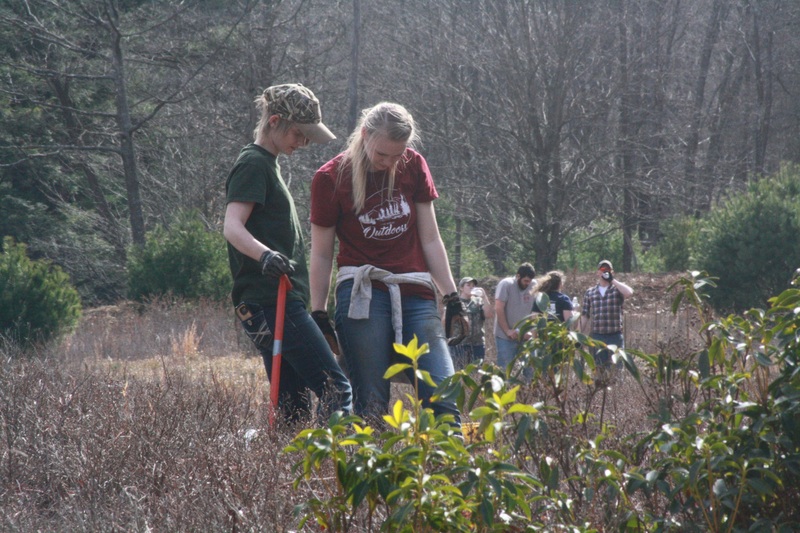 DuBois, PA – Some Penn State DuBois students helped plants trees near Rockton Mountain to help keep trout cool at S.B. Elliot State Park. Because of logging years ago in the area, the trees that shaded the stream had been cut down. The water had been too warm for trout to continue living there, but new trees could eventually make it habitable again. A group of students in the Penn State DuBois Wildlife Technology program partnered with local and state organizations to help improve the habitat of a wild trout stream in the area. Situated at the edge of S.B. Elliott State Park on Rockton Mountain are privately owned properties through which the stream, Montgomery run, flows. Eventually, the stream empties into the reservoir that provides the City of DuBois’ water supply. As part of their Silviculture class, students joined forces with representatives from the Clearfield County Conservation District, The Department of Conservation and Natural Resources’ (DCNR) Bureau of Forestry, and the Allegheny Chapter of Trout Unlimited to help improve the habitat for native trout in this section of Montgomery Run. The biggest effort has been in planting trees, which can make surprising changes, according to Kelly Williams, a watershed specialist with the Conservation District. The lack of trees in the area is due to the impact of a logging operation over a century ago. However, it’s not only because trees were harvested from the site. “A splash dam left here in the late 1800’s from logging caused this area to flood over and over again though the years, which didn’t allow trees to fill back in. It did allow for grass to take root. Once grass takes hold, that keeps the trees out,” Williams explained. The dam would have been used by loggers to intentionally flood their log landing in order to float timber downstream to a saw mill. But when the logging was done, the dam remained in place, with a portion of it still intact even today. While has dam deteriorated enough that the area no longer floods, it does remain a wetland, with soft, soggy soil. That led experts to seek out tree species to plant that would thrive in that environment. The tree species they chose were white pine, elderberry, river birch, American sycamore, and black willow. In all, 1,100 trees will be planted, with white pine being the predominate species, at 600 trees. “It’s really adding to my experience,” agreed student Katelyn Blystone, from Smicksburg, PA.
Williams, a graduate of the Penn State DuBois Wildlife Technology program herself, said a win-win is just what she had in mind when she contacted campus faculty for help on the project. Students Katelyn Blystone, right, and Morgan Silvis look over one of the saplings they’ve planted as part of an environmental repair and restoration effort along native trout stream Montgomery Run.